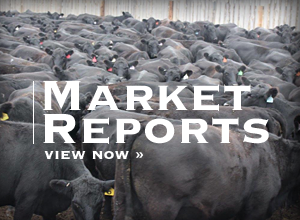 Cows are one of Mary Caraway's specialties. This black one looks ready to settle down for the night. Mary Caraway's Wood Pile Art uses a rustic technique and OSB board that lends itself well to ranch, farm, cabin, cottage and other decors. 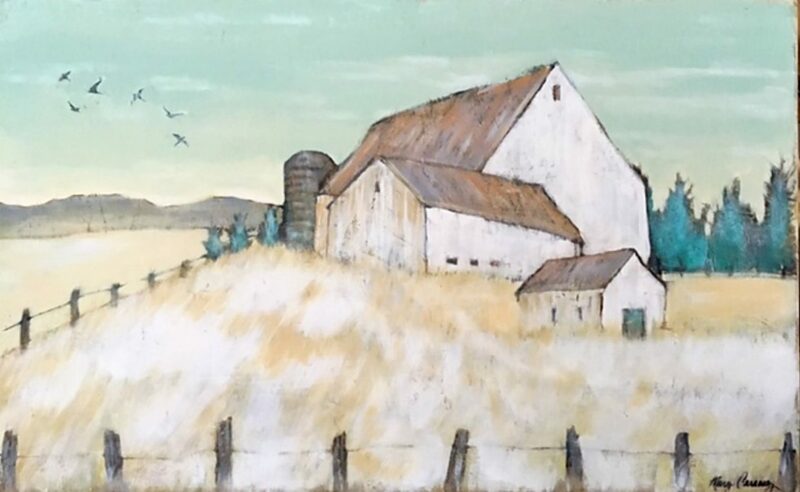 A white barn and outbuildings on OSB show off Mary Caraway's lovely, unique style. Winter at night on the farm seems quiet and peaceful in this Mary Caraway painting. These boots weren't made for walking but rather for many rural art-loving eyes to admire. Rural life is not only Mary Caraway's favorite art subject but also her chosen lifestyle. Mary and Ray Caraway enjoy hiking in the Colorado hills and mountains. Who knew you could find cows, barns, landscapes and pastures in a big old wood pile? Mary Caraway knew; or at least she discovered the beautiful fact seven years ago. Caraway's art brings to mind lots of vibrant descriptions: fundamental; enchanting; honest. 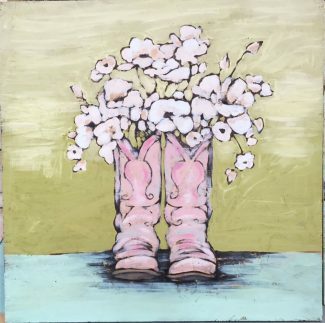 Her barns and farmhouses exude refreshingly basic rural charm; bold structures dominate but don't overwhelm landscaped backdrops; stoic cows stare back at you, sophisticated and wise in their humbleness; well-worn boots are transformed into sweetly proud flower containers. All make our incongruous world seem somehow more docile, even manageable. 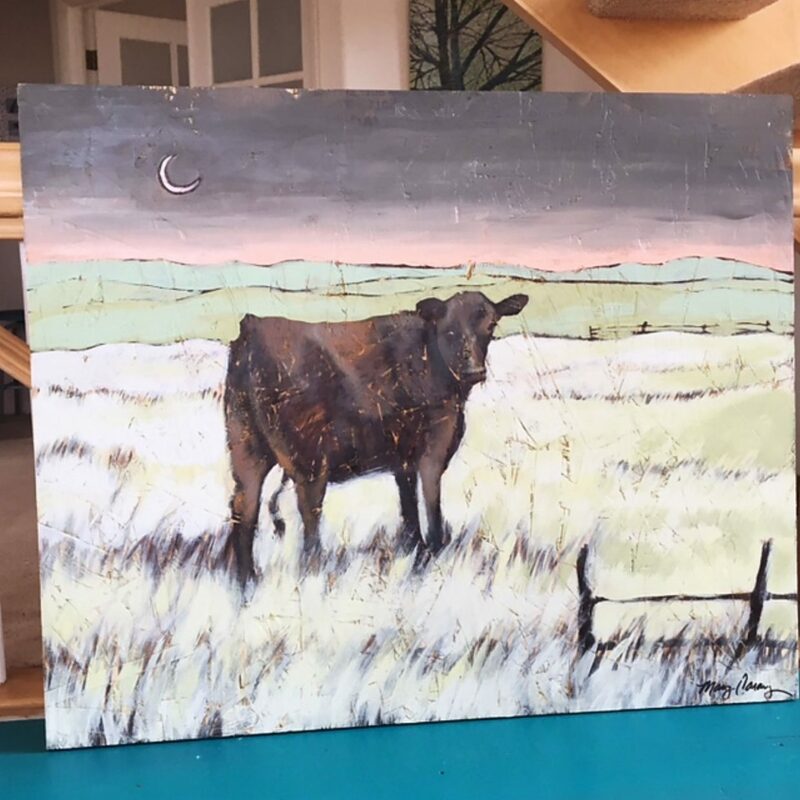 The Fort Collins, Colo., rural artist/illustrator began her life and multi-faceted career in Louisiana, growing up in New Orleans. It was there that Caraway's childhood was largely shaped by the art, architecture and spirit of the region. After studying fine art and graphic design at Louisiana State University in Baton Rouge, she worked as a graphic designer at Wile & East Design Firm, and then opened her own company, Caraway Design, in 1992. She eventually worked for other firms in Chicago and Washington, D.C. While in her 20s, Caraway became serious about painting. Her traditional watercolors included scenes with people, and portraits best-described as photo realism. Throughout her 30s, she enjoyed entering pieces in Louisiana juried shows, where she merited numerous first place awards. But her graphic design career, and caring for husband Ray and the couple's two sons, had pushed painting onto the back burner by the time the family relocated to the Fort Collins area in 2002. When the stay-at-home mom's boys got older, she again took up art and also began teaching her unique method. Over the years, Caraway had discovered she preferred a less realistic approach. First switching to a more graphic style with acrylics, she next "stumbled" into painting on wood after admiring a plywood artist's technique. However, she soon decided on OSB board rather than plywood for her rural pieces. 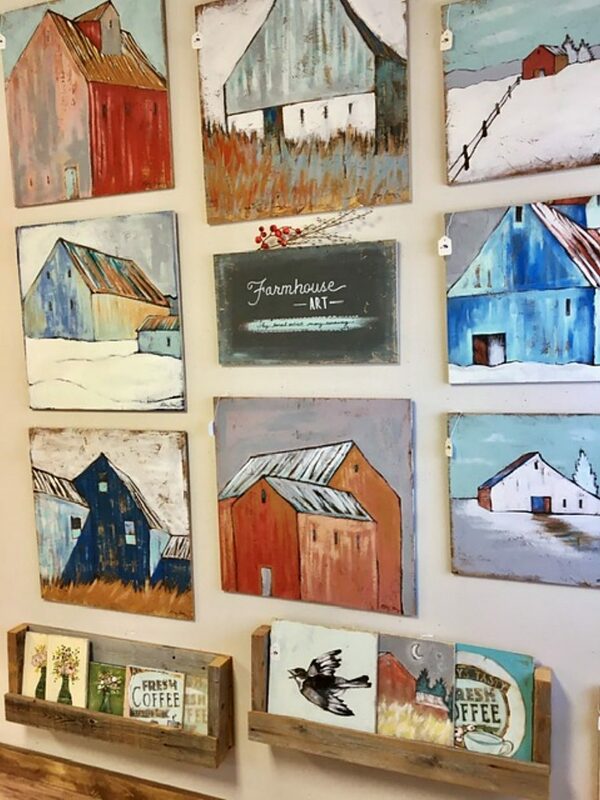 OSB, an acronym for oriented strand board, is not specifically manufactured for the art world but rather for construction uses such as sub-flooring, said Patti Catania, sales associate at Josephs Hardware and Home Center in Fort Collins. The composite wood material is versatile for artists and crafters partially based on its availability in 4×8 foot sheets, as well as by the square foot (cut to size at Josephs). Very little prep is necessary other than application of primer. A protective lacquer finish can also be applied to the finished piece of art. Caraway likes the fact that her work can be hung outdoors in a semi-protected setting such as a porch. OSB holds up well and its rugged appearance nicely fits into cabin, ranch or cottage décors. It lends a natural, organic character to each piece and saves buyers the expense of framing. 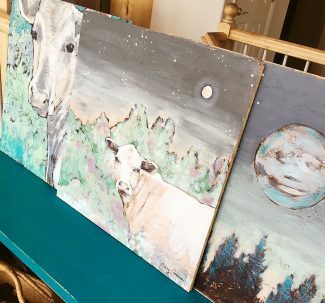 "My art comes ready to hang," Caraway said. Catania is impressed by the growing numbers of excited OSB artist-customers who Josephs has gained after seeing Caraway's work and/or taking lessons from her. So that's how Caraway came to discover cows, barns, landscapes and pastures in a big old wood pile; and pulled them out for delighted aficionados to enjoy. Then the "empty nester" with both sons in college selected the perfectly logical name for her artistic endeavors: Wood Pile Art. 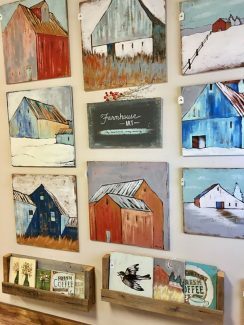 Besides OSB, she occasionally paints on other types of wood, most of which come from the large pile of firewood on the family's 40-acre property in the foothills near Masonville. It's also on, and surrounding, that acreage that Caraway gets many of her myriad ideas. "We live in a rural setting surrounded by pastures, barns, cows and stunning landscapes," she said. "I am constantly stopping my car to capture beautiful pics which are the inspiration for my work. 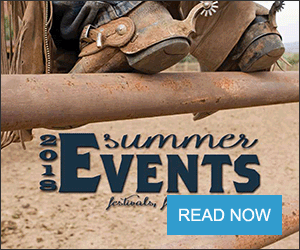 We also love the Western Slope and travel there two or three times each year to hike and take photos." 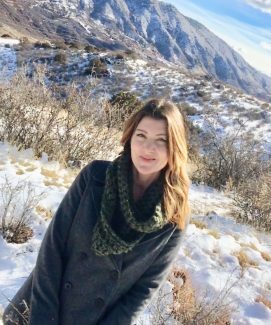 Besides Colorado's natural beauty, Caraway also credits her strong and abiding faith in God as a source of her inspiration. When not being inspired or applying her ongoing creativity to OSB, Caraway loves teaching children in public and private schools some of the skills she has mastered. She does so at a kids' summer camp held by Corner Comforts and, beginning 12 years ago, at Olive Tree Elementary in Fort Collins. That school offers a unique program of art, music and more for otherwise home-schooled youngsters. Adults can also study Caraway's techniques through classes she conducts two to three days a week. 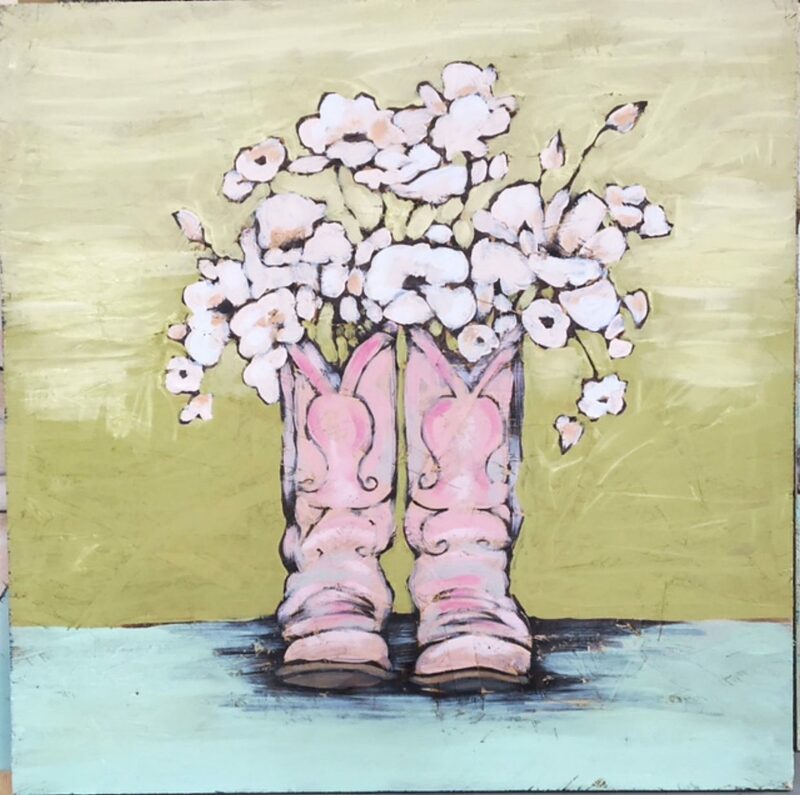 Caraway paints all sizes of commissioned pieces from 12×12 inches to 2×4 feet. 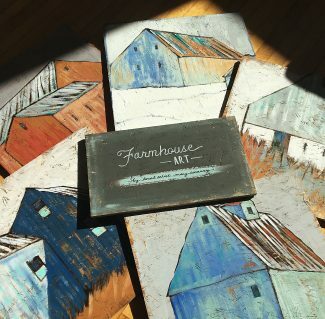 Family barns and farmhouses are particular favorites for folks seeking to memorialize structures dear to them or pertinent to their family history. Wood Pile Art can be viewed and purchased at several Northern Colorado shops: The Emporium at the Elizabeth Hotel in Old Town Fort Collins; Corner Comforts (which sells vintage home décor) in Fort Collins; Owl Canyon Coffee Shop, Wellington, Colo.; The Rainbow Restaurant, Fort Collins. 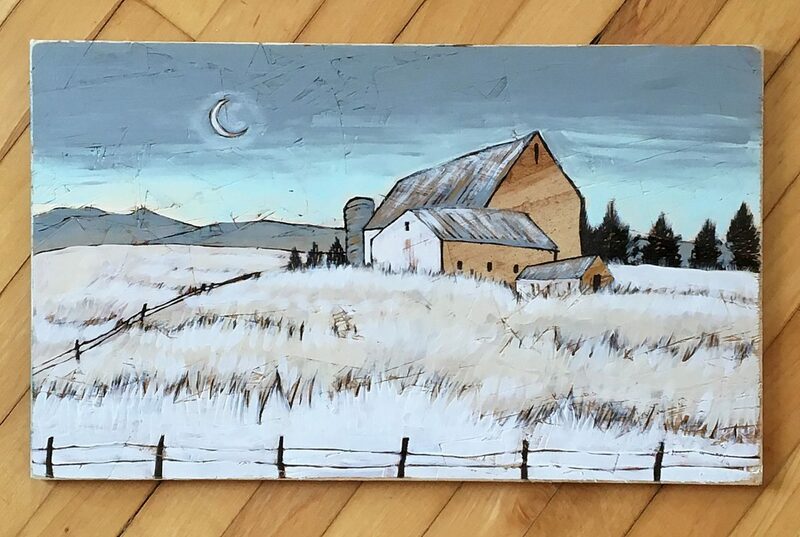 The artist also conducts an event during the year called Big Bold Barns Sale.